“We may, without knowing it, be writing a new definition of what science is for,” said Aldo Leopold to the Wildlife Society in 1940. A moderate but still crisp April breeze was playing in my hair as the sun worked to melt the last bits of frost in the silt. Shoots of prairie grasses were popping up through the mud, past shell skeletons of river mussels and clams. A Canada goose honked reprimands for our trespassing as other waterfowl passed overhead. We felt the freedom of adventure and excitement, as though we were exploring a newly washed world (despite the occasional years- or decades-old can or pieces of glass.) There were no human footprints but ours testing the flats to see which were quicksand-like muck and which were sand beds that could hold us. Two years before, the big decision to remove the dam in Willow River State Park in Wisconsin resulted in the loss of the lake and a new river channel cutting its way through the bottomlands. This was part of the legacy of Luna Leopold, the great hydrologist. It was he who convinced water scientists and engineers, policymakers and communities to start asking questions about dams and their effects on the river communities upstream and down–both wild and human. Out of these questions arose a movement to remove some dams and set the rivers free. That afternoon, I was supposed to give a talk on Luna’s father, Aldo Leopold, and Aldo’s multifaceted legacy, which included that of his children, students, scholars, organizations, and ideas. But when I asked myself, should I read up to prepare or visit the park, I thought, what would Aldo do? What would any of the Leopolds do? Go to the park! 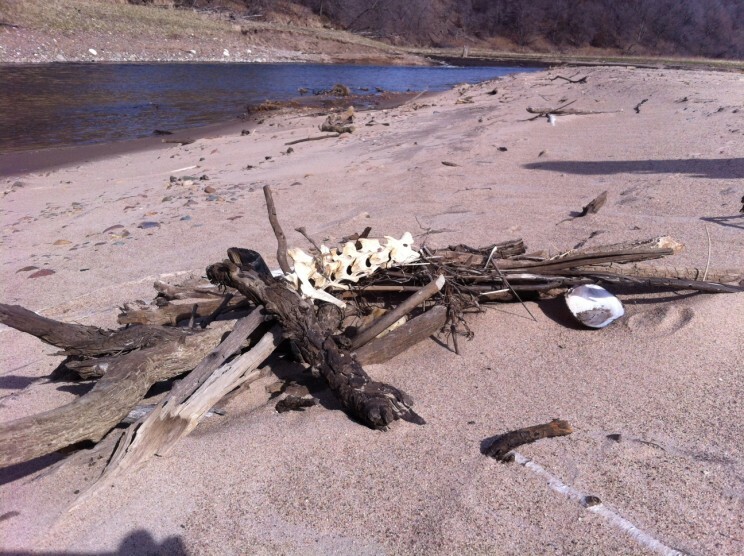 Art project on the river beach in Willow River State Park by Marybeth Lorbiecki. Used with permission. 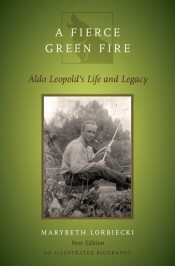 The Leopold story is all about the ripple effects of a man who lived dedicated to enjoying, studying, preserving, and conserving those things he deeply loved – “things natural, wild, and free.” It was Aldo who started the field of wildlife management and ecology, started the US National Forest wilderness system, wrote A Sand County Almanac and proposed the “land ethic,” among so many other contributions to conservation. But it was Luna who then applied that land ethic to the rivers, and it was Aldo’s eldest son, Aldo Starker Leopold, who applied it to wildlife in the national parks. Starker’s “Leopold Report,” which called for our parks to be a showcase of the original flora and fauna, brought bison and wolves back to Yellowstone. In our 2016 celebration of our national parks, we owe Starker some memory and gratitude. Featured image credit: Aldo Leopold in Rio Gavilan by USFS Region 5. CC BY 2.0 via Flickr. Marybeth Lorbiecki has long been involved in the field of ecological ethics and conservation. Currently she is editor and the director of Interfaith Oceans (formerly Interfaith Ocean Ethics Campaign). She is the author of A Fierce Green Fire: Aldo Leopold’s Life and Legacy.